We provide emergency roller shutter door repair throughout the UK and aim to attend your preferred call out option as fast as we possibly can. We'll inform you when you call as to how soon we can be on site so you're never left waiting in the lurch. We guarantee our price is the cheapest you'll find anywhere and it's the same price anywhere in the UK. We also have the cheapest hourly rate within the industry and the fast majority of our jobs are fixed within the hour saving you money. How can we be so sure we are the cheapest? Simple! We offer a number of different packages depending on the urgency of your issue, and we also have over 40 engineers who are stationed across the UK so that we can always get to your job quickly without having to charge you extra fees for traveling across the country! What if you can't repair my shutter right away? The fast majority of issues (97%) are fixed on our first visit. However, If for any reason we're unable to repair the problem immediately. We'll secure your premises and be back to fix the problem normally within 24 hours. All our work comes with a 12 month warranty. 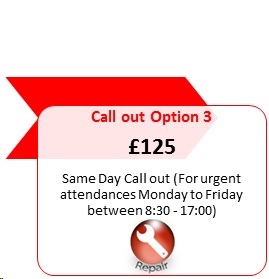 The call out rates above are for the call-out handling and include travelling to and from site. Time on site is charged at standard rate [between 9:30-16:00] £24.99 per hour and will be charged from the time of arrival on site and there after. Excludes Holidays, Bank Holidays, Saturday and Sunday. All prices are excluding VAT. All parts are chargeable. A quotation will be provided prior to deploying an engineer. A quotation will be provided for any additional works or parts required. Payment is by credit/debit card, in full and to include the first hour on site and must be paid prior to us accepting the work order. All prices quoted are based on areas local to our engineers. [see our standard "Terms & Conditions"].